A terrific athletic year for Duxbury wide receiver Ryan Reagan just keeps on getting better. On Wednesday with his family and head coach Dave Maimaron in attendance, Reagan officially committed to continue his football career at Harvard University. 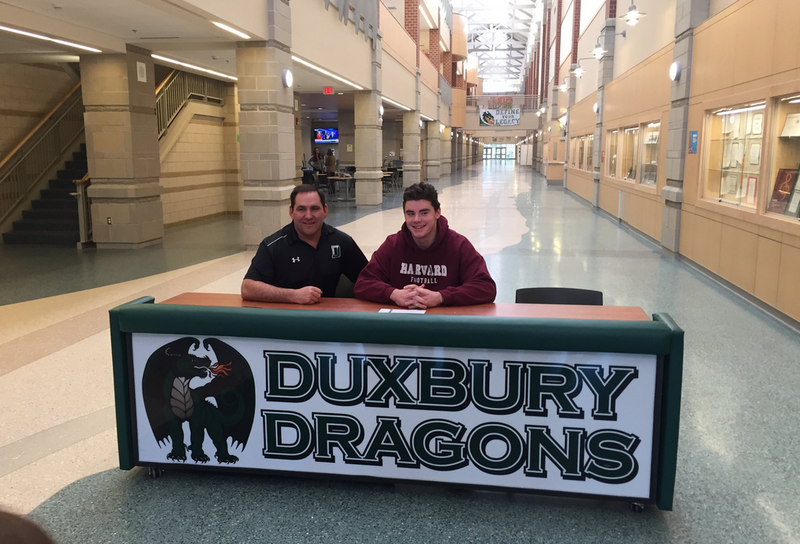 It has been quite the past couple months for Reagan, who back in December helped propel the Dragons to the Division 2 state championship, catching eight passes for 155 yards and three touchdowns at Gillette Stadium. Most recently, while a member of the Duxbury varsity basketball team, Reagan scored 30 points and grabbed 24 rebounds to spearhead a 73-64 upset of Brighton. Reagan, who announced a verbal commitment to play for the Crimson Tide in October, said Harvard made a big impression on him from the get-go. 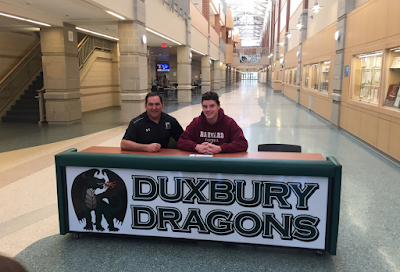 Over the course of his time at Duxbury, Reagan has dealt with a plethora of injuries that have kept him on the sideline, including several on his ankles and feet. But, whenever he was on the field, Reagan was an unstoppable force. His 6-foot-4 inch 225 pound build made Reagan a matchup nightmare for defensive backs across Massachusetts, and once he had the ball in his hands, multiple defenders were often needed to take him down. Maimaron struggled to put into words the impact Reagan has had on the program at Duxbury. Despite his injury history, Reagan said the Harvard coaching staff implored him to stick with basketball in the winter. Sure enough, when he was finally medically cleared in the beginning of January, Reagan was back out on the court trying to help guide another team to Massachusetts glory. “(Harvard) really looks for two sport athletes, that was one of the things they liked about me,” said Reagan. So, while Duxbury will certainly miss Reagan when he has gone, they are still fortunate to enjoy his athletic excellence for at least another month.